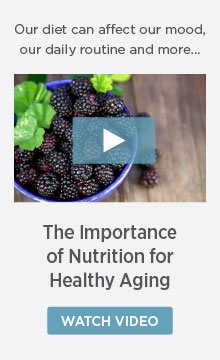 Nutrition plays a major role in keeping seniors healthy and maintaining or improving overall well being. A healthy diet can guard against numerous health challenges such as osteoporosis, high blood pressure, and heart disease. By following a few simple guidelines, there’s an endless variety of easy and nutritious meals that seniors can make on their own. Try ancient grains, quinoa, faro, barley, etc. What you don’t eat is just as important as what you do. It’s a good idea to limit or avoid foods that don’t provide much nutrition but add a lot of calories. Often that’s snack or dessert foods such as chips, soda, cookies, cakes, and pies. Try to avoid saturated and trans fats, use salt sparingly, and limit alcohol. Here are some ideas for putting together easy, nutritious meals. Mix and match, and add your own twists for variety! Scrambled eggs (or egg whites if you’re watching your cholesterol) with diced onions, mushrooms, or chives. Fruit, such as sliced apple or pineapple, orange or grapefruit sections, grapes, or melon balls. A dollop of yogurt (don't forget greek yogurt!) adds freshness and zest. Whole grain toast. Try apple butter, naturally sweetened jam, or a drizzle of honey instead of butter! Homemade tuna salad. Try using canola mayo and adding pine nuts or chopped cashews for added texture. Add curry seasoning for extra flavor. Serve as an open-faced sandwich or as a salad. Green leafy salad with your favorite vegetables: tomatoes, cucumbers, scallions, olives, and avocado. Homemade soup. Start with vegetarian or chicken stock, then add your favorite vegetables and seasonings. Potatoes add a nice thickening texture, and squash or fresh corn add a sweetening factor. Best if made the day before, but a large batch can be frozen into individual portions for anytime use. Baked or broiled chicken breast (skin removed) or fish fillet (tilapia, salmon, and tuna are delicious choices). Season with a squeeze of lemon and herbs such as rosemary or thyme. Potato, yam, or squash — baked or broiled with the poultry or fish. Baking them together in tinfoil will preserve the flavors and speed the cooking time. Steamed vegetables such as broccoli, carrots, cauliflower, asparagus, beets, spinach, or kale. Choose different combinations for variety and rounded nutrition. The USDA recently replaced the old “food pyramid” with “MyPlate,” which illustrates how important it is to have balanced nutrition. The website provides excellent information and tips on maintaining optimal nutrition for the whole family. The government website MedlinePlus has many resources for seniors, as well.